A Wheatstone bridge is a measuring instrument invented by Samuel Hunter Christie in 1833 and improved and popularized by Sir Charles Wheatstone in 1843. 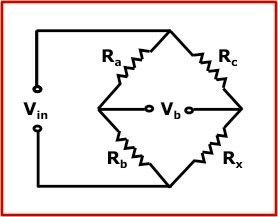 The Wheatstone bridge is an electrical bridge circuit used to measure resistance. The Wheatstone bridge network consists of four resistors Ra, Rb, Rc and Rx interconnected. If the ratio of the two resistances Rb / Ra is equal to the ratio of the two Rx / Rc, then the voltage across bridge Vb will be zero. It is widely used across industry even today.